A former knitting student of mine called me the other day and asked if I would help her with something. 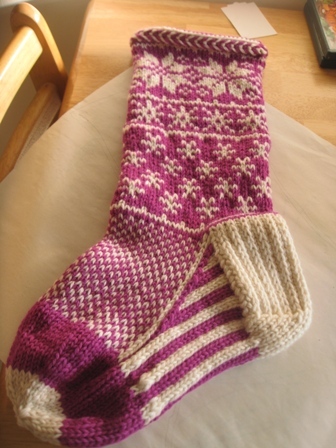 She’d knitted 6, with one more to go, Christmas stockings and wanted help lining them. 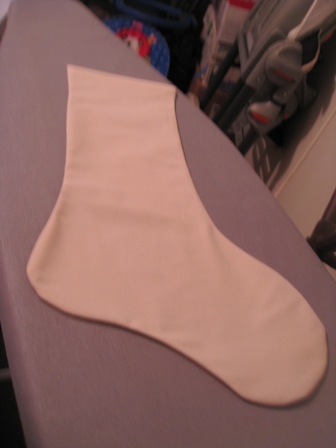 She said they were all stranded and thought a fabric lining would ensure longevity since she intended these to be family heirlooms. Before I could think about the amount on my plate I said yes, of course. Then the next day flipped out at how much I have to do. But then I saw them…WOW! Look at all the work she put in! I was so impressed and honored in a way that I had been a somewhat efficient enough teacher to inspire someone to reach these heights. So here’s the prototype….it fits perfectly!! Six more sewed, ribbons all attached and she picked them up on Saturday. I’m sure they are hanging perfectly by her fireplace. It’s good to stop and step away from yourself for a little while.